"I am very pleased to see that the work GVE is doing with the communities has a level of sophistication without sacrificing technical completeness. Global Village Engineers provides a one-of-a-kind engineering challenge. The challenge is to make sure that technical information is presented in such as way that communities, regardless of their technical background, can intuitively understand how to put that knowledge to best use." 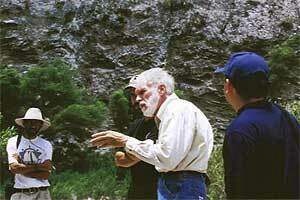 "The trip to the Sierra Gorda Biological Reserve in Queretaro, Mexico, was extremely rewarding in a very personal and professional way. The rewards came from being able to call up and apply the professional skills I have collected over the years to a problem set that was, in fact, not all that well defined before we arrived. They also came from interacting with our hosts for whom we were providing what they so much needed and for which they were so appreciative. Given their overall state of development, I come away with great satisfaction feeling that we contributed toward making a measurable difference in the overall quality in the environment and conditions of life there. That sense of movement because of our personal actions is hard to come by in the U.S.A."
- William Moeller, University of Massachusetts, Professor Emeritus. "I can honestly say that I've never met such a wonderfully well-rounded group of intelligent, interesting, and impassioned engineers. Global Village's mission has permeated every aspect of my professional development." "Our rewards for this work were many; the satisfaction of being able to call up and apply the professional skills developed over the years, the pleasure of meeting colleagues with shared concerns in another culture and the feeling that we had made a measureable contribution to an effort to preserve one of earth's pristine places." Global Village Engineers is a 501(c)3 registered charitable organization.